Teambuilding that builds comraderie by having fun cooking! Creative Cooking School celebrates its 10 year anniversary of “Teaching Professional Techniques to the Home Chef.” In the past 10 years, Creative Cooking School has become one of the top five ranked Recreational Cooking Schools in the United States. The school offers over 300 types of hands-on cooking classes from 30-Minute Gourmet to Desserts from Paris to Taste of Tuscany. The school’s décor is Tuscan meets professional equipment meet high tech. The school is conveniently located 4 miles west of the Las Vegas strip. Creative Cooking School’s Teambuilding Gourmet—A TASTE OF SUCCESS programs, Teambuilding Gourmet have become the top location for teambuilding with food and cooking competitions. 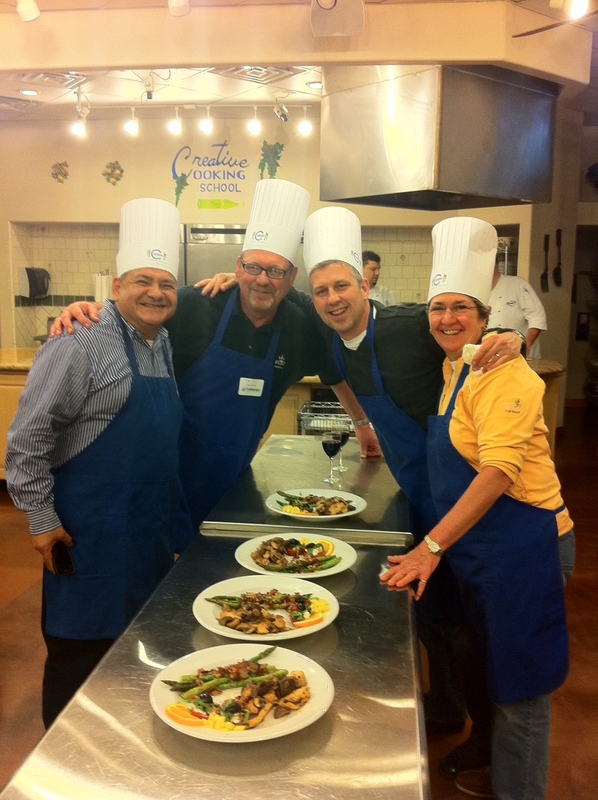 Our Las Vegas Teambuilding programs build camaraderie while having fun cooking. Forget rope courses and golf outings. Cooking is the new wave in corporate Team building exercises. Taking inspiration from Rachel Ray, "Iron Chef" and "Top Chef", companies like Microsoft, T-Mobile, Eli Lilly and Nike are sending their employees off to chop, dice and sauté their way to better sales and management teams. Food is the universal language and nothing brings people together more than creating a meal. 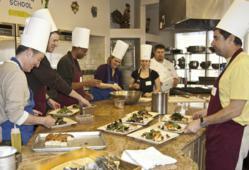 Creative Cooking School is franchising their cooking school nationally and globally. Creative Cooking School is the only Cooking School franchise currently available. If you are a foodie and have a passion to own your own business, please call us today to find out more information about owning your own Cooking School Franchise. Learn to cook like the pros today and call Creative Cooking School at 800-611-CHEF or 702-562-3900. Also find us on Facebook at: CreativeCookingSchool and on Twitter at: LearnTo_Cook. Listen to a Radio Interview with the President of the Creative Cooking School and Debbie Hall on "Dining with Debbie."